Marjan Harbison is known for her dynamic classes and down-to-earth teaching style that focuses on alignment, clear instruction and creative sequencing. Marjan, an ERYT 200 and RYT 500, is a wife, mother of three, Integrative Health Coach, eternal student, seasoned expat and lover of life. She has spent twenty years practicing and studying yoga. Certified in various styles of yoga, her passion is teaching Rasa Yoga, a Bhakti fusion of form and flow yoga. 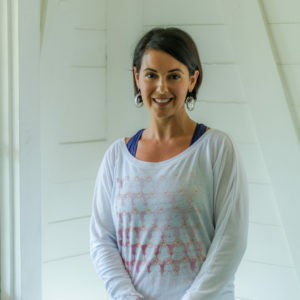 Her classes integrate tantric philosophy, asana, mantra, mudra, pranayama, meditation and ritual to create a deep, well-rounded experience for her students. She is dedicated to offering yoga and wellness practices in an accessible way that incorporate into everyday life. Her classes will inspire you to explore, discover and embrace the whole of yourself, physically, mentally on and off the mat, so you can offer your truest self to the world. Unfold the true Radiance of your heart in this form and flow class that will include mantra, mudra and pranayama. Through this practice we will untie the knots of the heart to tap into our true essence and reveal the radiance of our heart with unconditional love and compassion. Esta clase será dictada en inglés, sin traducción simultánea.